Location: HELIO CENTER, Road 2-9 near LotteMart. This is one of the best places for food lovers with tons of local food with reasonable price. There are a lot of shopping stuffs, and lots of music performances. Food is the spirit of this night market, with a wide selection of different types of food. 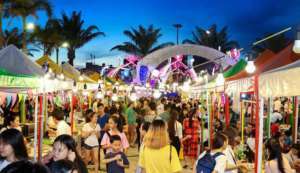 Currently they have around 150 stalls of foods and beverages, and they keep open more and more food as the need of their customer to be like a big food court in Da nang. Beside food, this market is well known for its low cost good to purchase. You will find so many things such as fashion, foot wares, phone accessories etc. Then you can rest and enjoy a lot of performances. With more than 200 shops stretching on 1km of Le Duan Street, this place is a purely shopping paradise for low cost shopping. They have most of the things such as clothing, shoes and food wares, cheap jewelry etc. They also have some food and drink stalls so if you get tired or thirsty after shopping, you can take a break and enjoy foods. This place is self-managed, so take care of your belongings! Opening time: from 17.00- 23.00 on weekday, 17.00 – 24.00 on weekend. This place is not really an authentic experience but more like an international deluxe food court. 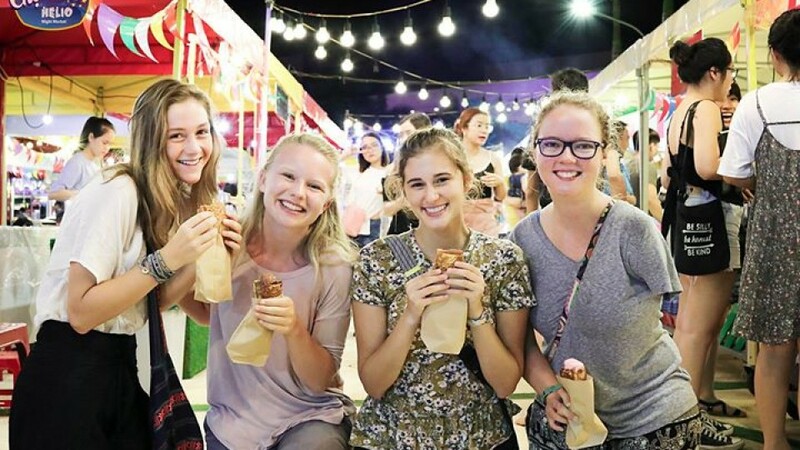 Thera are 18 professional stall with different cuisines from not only Vietnam but also many other countries. Don’t miss the legendary 7 bridges beer stall, where you can taste 7 different bottle of beers named by bridges in Danang and other famous places all around the world such as: Fire IPA (Dragon Bridge Danang), Sunset Weizen (Trần Thị Lý bridge Danang ), V.R.A (Thuận Phước bridge Danang), Golden Ale (Long Biên bridge Hanoi), Imperial IPA (Cần Thơ bridge @ Cantho city), Sakura Pilsner (Japanese cover bridge Hoian) and New York Rye (Brooklyn bridge – USA). Located at Hoa Khanh market, the biggest market in Lien Chieu District, this market is a great place to buy goods for working labour and students. 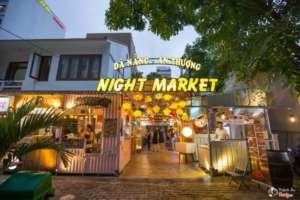 With more than 100 shops specialized for clothes, foot wares, fruit, food, it ideally became a popular night attraction for local people. This is the furthest market from city center of Danang (12 km far away from Han Bridge), so you go there with careful consideration.